Wednesday was moving day at the PokerStars European Poker Tour (EPT) London Main Event as the 114 players that started Day 3 were trimmed down to just 32. A number of big names fell by the wayside on Day 3, but plenty of others survived, including three former EPT Champions who will have a shot at becoming the first repeat winners on the popular tour that is now into its ninth season. The tournament began with 647 players over two starting flights earlier this week, and the 114 players who returned to the poker tables at the Vic on Wednesday found themselves right on the money-bubble –which burst very early on in the proceedings when Matthew Ashton was eliminated in 97th place—and once the money bubble burst play really picked-up. Among the players still in contention for the EPT London title are, Steve O’Dwyer, Theo Jorgensen, Mike McDonald, Nicolas Chouity, Ruben Visser, Russell Carson, Jason Mercier, Annette Obrestad, and Chris Moorman. 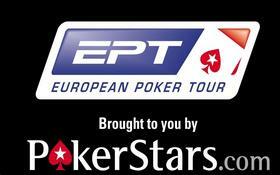 Mercier (2008 EPT San Remo Champion), McDonald (2008 EPT Dortmund Champion), and Chouity (2010 EPT Grand Final Champion) are the previous EPT winners looking to make history in the coming days. Action will resume at Noon local time with the remaining players entering into Level 20 of the tournament, with the blinds at 5,000/10,000 with a 2,000 chip ante. The plan for Day 4 of the tournament is to play down to the official final table of eight players before calling it a day. The final eight players will then reconvene on Friday to crown a champion and award the £700,000 first-place prize, and add their name to the list of former champions at the EPT London that includes the likes of Victoria Coren, Benny Spindler, and David Vamplew.. This entry was posted on Thursday, March 14th, 2013 at 7:51 am and is filed under Poker News. You can follow any responses to this entry through the RSS 2.0 feed. You can leave a response, or trackback from your own site.